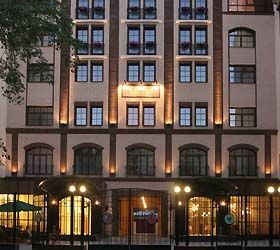 Offering striking, garden-themed décor, rich buffet breakfasts, and free Wi-Fi, this 4-star design hotel in Saint Petersburg is quietly located on Vasilyevsky Island. Vasileostrovskaya Metro Station is 1640 ft away. 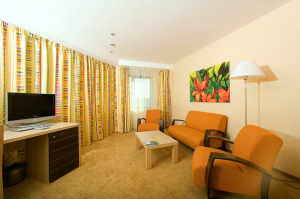 Just a 10-minute bus ride from the Lenexpo Exhibition Center, the Nashotel is decorated in cheerful, floral colors. 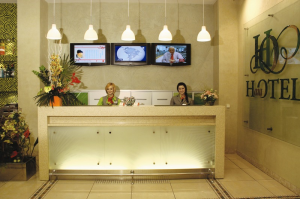 The Nashotel has spacious, soundproofed rooms with a flat-screen TV, safe, and desk. 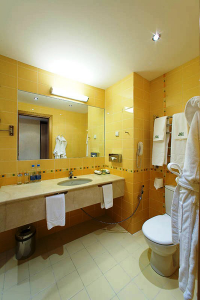 Each bathroom includes free toiletries and a cozy bathrobe. 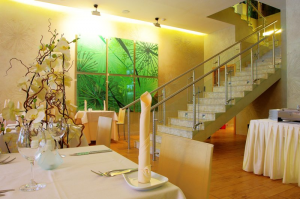 Guests can enjoy Russian and European dishes in the Nashotel’s elegant La Botanique restaurant, featuring unique lamps. The courtyard terrace is the place to be in summer. Palace Square is about one mile from the Nashotel Saint Petersburg. Moscovsky Train Station is 4 miles away. Vasileostrovskiy is a great choice for travelers interested in excursions, theater and romantic. Metro station: Vasileostrovskaya — 0,4 km. Costs: 3040 — 13000 rubles.